The Flare150™ digital Art Projector from Artograph is the next step up from the popular Flare100, with enhanced brightness and greater resolution, still in a compact, portable size. The Flare150 is ideal for projecting photos and images for tracing, layout, and design of your artwork. For artwork of extremely small size up to large portrait size. Included are built-in grids in dozens of useful patterns for layout and design, available only with Artograph digital projectors. Flip, reverse, rotate, grayscale, adjust color temperature and tonal values of your image. The Flare150 can operate on rechargeable built-in battery (2.5 hours), or plugged in. HD 1280 x 720 resolution with 150 lumens of brightness. Flare150 on the Artograph Digital Projector Table Stand. Projects from most digital sources, smartphones, tablets, and computers. Mac/Apple users may require an additional connection adapter. It is strongly recommended that if you are buying any Apple adapter you buy the official, branded or authorized one as sold by Apple and authorized sellers. Difficulties have been found with unauthorized adapters failing to work after Apple/Mac does certain updates. Backed by Artograph’s Lifetime Technical Support! Flare150 comes with a remote control (batteries included), power cord, HDMI cable, storage bag, SD card reader, and an Artograph flash drive with FAQs and demo images. This is the instruction guide included on the CD-ROM with your projector. Need help choosing the right Artograph projector for your needs? Please visit our Making the Right Choice section! 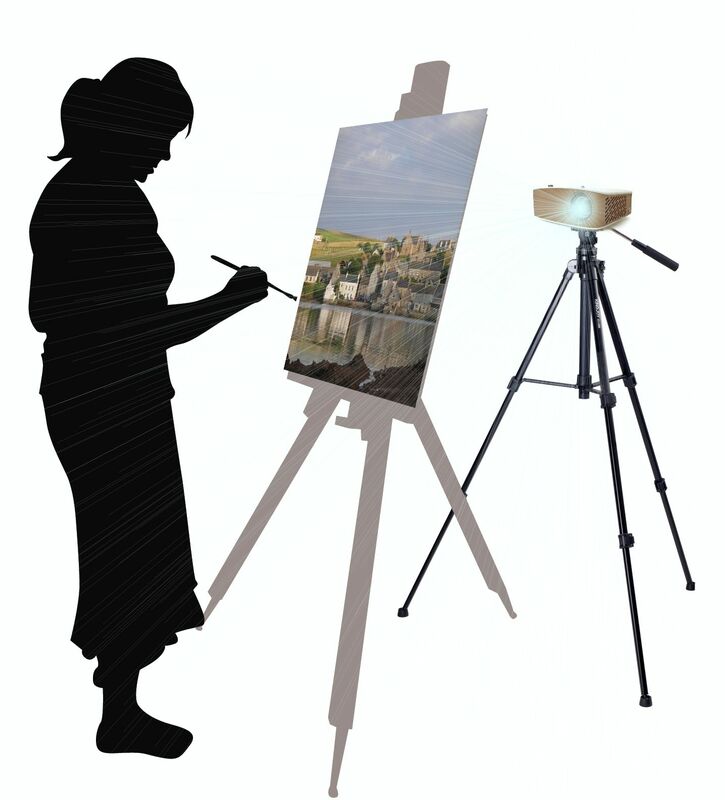 The popular digital Art Projector line from Artograph expands to give an option for every artist. The FLARE150™ Art Projector sets the artist free with a battery-operated projector in a size to go anywhere. HD 1280 X 720 projection with 2.5 hours of battery operation time. The INSPIRE1000™ Art Projector continues upgrading the Artograph projector line stepping up from the popular Inspire800. The IMPRESSION1400™ Art Projector is the powerhouse projector with full HD and 1400 lumens of brilliance. Powerful enough for even well-lit projection areas, this is the studio and workshop projector for your largest scale, most detailed work. The Impression1400 adds a new dimension of skew control, with edge adjust acting with both vertical and horizontal keystone control. All of these projectors includes Artograph’s built-in grids for design and composition. The Flare150 and Inspire1000 include 36 custom grids patterns including 15 new Rule of Thirds grids in the most used aspect ratios and sizes. Use the grids and patterns alone, or superimpose them over your image for precision layout. Rear screen projection bright enough to show through most canvases and papers for shadowless projection tracing.